Rwanda – “The Land of a Thousand Hill” is a small landlocked country in east-central Africa which is in the process of recovering from major ethnic strife of the mid-1990s. Rwanda has 5 volcanoes, 23 lakes and numerous rivers some forming the source of River Nile. The country lies 75 miles south of the Equator in the Tropic Capricon, 880 miles “as the crow flies” west of the Indian Ocean and 1,250 west east of the Atlantic Ocean – literally in the heart of Africa. With a land area of 26,338 Km² – one of the Africa’s smallest countries. Rwanda is bordered by Uganda to the North, Tanzania to the East, Burundi the south and Democratic Republic of Congo to the west. Small as it is, Rwanda has an encredible treasure trove of biodiversity that requires protection. The Albertine Rift Eco-zone (ARE), the region that stretches across six countries with Rwanda as its epicentre, is of particular importance as it is an exceptional level of species endemism. Scientists regard is having the highest level of biodiversity on the continent. Nature lovers will be impressed by the variety and the rarity of what can be observed visiting Rwanda but there is more to Rwanda than the protected mountain Gorillas and Albertine endemics. The shores of Lake Kivu boast some of the best inland beaches in Africa and offer an opportunity to explore the many small islands on the Lake..
Kigali, the Capital and Conference hub of East Africa, forms the Central stepping stone to various destinations within the country and Central and East Africa. The city is green, vibrant, safe and brews superb homegrown tea and Coffee. 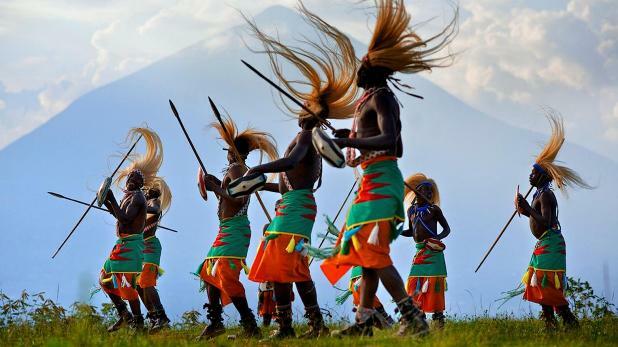 Although Rwanda is all too often associated with the 1994 Genocide that resulted into the mass murder of as much as 20% of the country’s total population, the country is taking giant strides toward cultural recovery and investments in the future. The country lies within the Great Lakes region of Central Africa and boasts a moderate climate. Mountains dominate the centre and west of the country, while the East consist of savannah, plains and swamps. The tension was associated with the traditionally unequal relationship between the dominant Tutsi minority and the majority Hutus. The presidential guard began murdering Tutsi opposition leaders, and soon policemen and soldiers began attempting to murder the entire Tutsi population. In 100 days, beginning in April 1994, Hutu rampaged through the country and slaughtered an estimated 800,000 Tutsi and their moderate Hutu sympathizers. A 30,000-member militia group, the Interahamwe, led much of the murderous spree, but, goaded by radio propaganda, ordinary Hutu joined in massacring their Tutsi neighbors. Although the genocidal slaughter seemed a spontaneous eruption of hatred, it has in fact been shown to have been carefully orchestrated by the Hutu government. This became known as 'Rwanda Genocide’ and it is still what most people think when they hear or read about ‘Rwanda’. According to the population projections, it is estimated that the total population of Rwanda in 2012 was around 11,033,141. Rwanda's population density, even after the 1994 genocide, is among the highest in Sub-Saharan Africa at 230/km² (590/sq mi). This country has few villages, and nearly every family lives in a self-contained compound on a hillside. The urban concentrations are grouped around administrative centers. Over half of the adult population is literate, but no more than 5% have received secondary education. The most recent statistics on religion in Rwanda were published by the US Government in 2013, yet the source information dates back to the national Census of 2002, which reports that: 56.9% of the Rwanda's population is Roman Catholic, 26% is Protestant, 11.1% is Seventh–day Adventist, 4.6% is Muslim (mainly Sunni), 1.7% claims no religious affiliation, and 0.1% practices traditional indigenous beliefs. The figures for Protestants include the growing number of members of Jehovah's Witnesses (20,509 in 2011) and evangelical Protestant groups. There is also a small population of Baha'is. There has been a proliferation of small, usually Christian-linked schismatic religious groups since the 1994 genocide, as well as substantial conversion to Islam. There is no time difference between winter and summer months in Rwanda; it's always two hours ahead of Greenwich Mean Time (GMT+2) – Rwanda is in Central Africa Time Zone (CAT). Kigali is 6 hours ahead of Washington D.C. - USA, 1 hour ahead of London - UK and 8 hours behinde Sydney, Australia. Rwanda’s unit of currency is the Rwandan franc (RFr), which is sometimes also abbreviated to ‘Frw’. It’s best to come to Rwanda with US dollars or euros in cash. The only useful bank branch in the country is Banque de Kigali in the capital, which offers cash advances on credit card and can change travellers cheques, neither of which is possible in the provinces. There are ATMs in Kigali, but they are not yet wired to an international network. Credit cards can be used in some upmarket hotels and restaurants in Kigali. Rwanda's International Dialling Code is +250. Calling from Rwanda, you need to dial 0044 for the UK, or 001 for the United States, followed by an area code and local number. Typical Rwandan meal consists of mostly starch – such as rice, sweet potatoes, corn, millet, cassava, yams cooked with beans, peas. Also flour cooked into porridge - and fresh fruit, including avocados, mangos and papayas. Food in Rwanda varies from mediocre to good. Umutsima ( Cassava and corn), isombe (cassava leaves with eggplant and spinach) and mizuzu (fried plantains) are some of Rwanda's traditional dishes. Drinks include local beer and ikigage, a locally brewed beer made from sorghum. Fresh fruit and the Belgian-inspired cuisine are usually good; otherwise, whilst hygiene standards are generally high, results can be variable. There are medical facilities of Western standards in Kigali; elsewhere facilities are rudimentary. It is generally wise to be up-to-date on vaccinations for typhoid, tetanus, polio and diphtheria. Many travellers also have the Havrix vaccine to guard against infection by hepatitis A and a yellow fever certificate is usually required for entry into Rwanda. Malaria is widespread throughout lowland Rwanda, so malaria precautions are generally essential. AIDS is common in Rwanda; HIV infection rates are high. Generally, this isn't an issue for visitors, though they should be aware of the current situation, and take the same wise precautions to avoid infection as in most other countries. We understand that blood supplies used by the private hospitals here have been carefully screened for years. The main language spoken in Rwanda is Kinyarwanda (a Bantu language, also known as 'Rwanda' or 'Ruanda'). French is widespread and English is also spoken by many people who are in contact with visitors. All people wishing to enter Rwanda must possess a valid passport or other internationally recognized travel documents, which, in principle, contains a visa corresponding to his/her purpose of entry into Rwanda obtained in advance from the nearest Rwandan embassy abroad. Currently (Oct 2014) only USA and UK passports get free visa upon arrival – free visa for a stay of up to 90 days. Citizes of these two countries do not need to purchase a visa when travelling to Rwanda; passports are just stamped on arrival. Apparently; Canada, Germany, Sweden, Hong Kong used to be on the list but not anymore! Rwanda visas are easily obtainable on arrival at all entry points but you can as well appy online. However, passport and visa requirements are liable to change at short notice.always check with your local Rwandan Embassy for the latest regulations. Rwanda presents visitors with a pleasant tropical highland climate, although rainfall is not uncommon. There are two rainy seasons (February to April, November to January); mild in mountains with frost and snow possible. Average daytime temperature is around 24°C, except in the higher mountains, which take up a lot of the country, where the range is 10°C to 15°C. Rwanda can be visited at any time of year. The dry season from mid-May to mid-October is easier for tracking mountain gorillas, but the endless hills are barren, a contrast to the verdant greens of the wet season. Peak season for gorilla tracking is July and August; travelling outside this time means it is easier to arrange a permit.